It was getting dark when we pulled back in the yard, but Jake was still full of energy. We each had the Little Debbie snacks he picked out for dessert and I tucked him into the sleeping bag on the couch to watch a movie. He started drifting off around 10:00, so I turned everything off and got the bedroom ready. He got a big kick out of peeing off the deck before bed. We snuggled together in the trundle bed and he was softly snoring in minutes. I stayed up a little bit to read, but turned out the light by 10:30. Figured we had a big day ahead of us. Both of us up around 7:00. Jake wanted to get dressed and out the door right away to get back to his “construction site” so out we went. I cleaned up and organized in the pole barn while he worked around the burnpit. At 8:30, he decided he was ready for some breakfast, so we hopped in the truck for Aunt Judy’s. Another first for Jake. 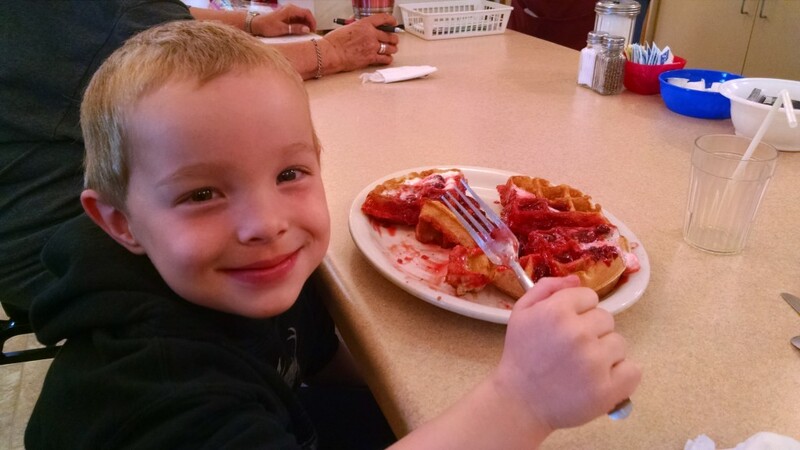 He ate most of a big strawberry waffle and some of my omelette. He even charmed our waitress out of some extra whipped cream. Judy sat next to him and he told her all about the snapping turtle and the other animals we had seen up here. She told him about the doe and two fawns that come around the restaurant and everyone on the staff commented on what a polite and well-behaved boy he was. Did his daddy proud. After breakfast, I started in on one of the only projects I really wanted to tackle this weekend. 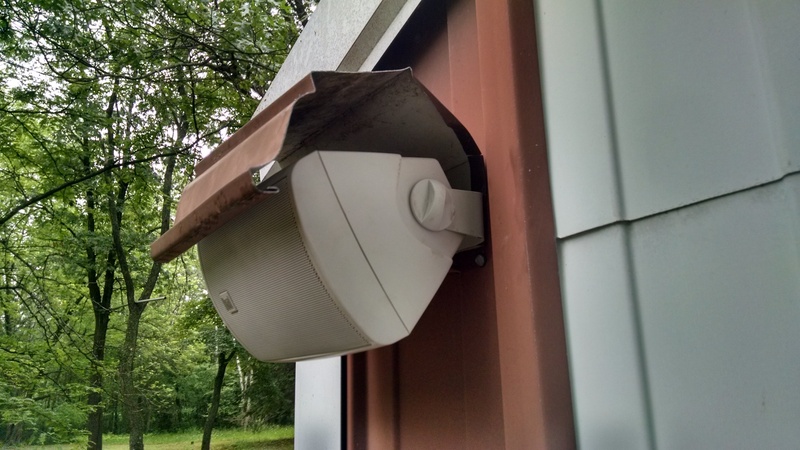 Even though the speakers I bought for the outside of the pole barn are rated for use outdoors, I still wanted to give them a little protection from the elements. I cut some small sections out of a salvaged length of gutter that I found outside of the woodshed, bent them into shape, and they now serve as little canopies for the speakers. The gutter is even a close color match for the pole barn paint, so they blend in pretty well. The speakers sound a lot better now that they’re mounted and the music covers the yard without having to be too loud. The overcast skies gave way to a drizzling rain around 10:00 that came and went for the rest of the morning. This was disappointing, since one of the reasons we picked this to be Jake’s first overnight trip was that the weather was supposed to cooperate. It didn’t seem to bother him much, though. He patrolled the yard in his Power Wheels ATV and stayed hard at work on his construction site. We got a visit from Lyssa and Josh at noon. 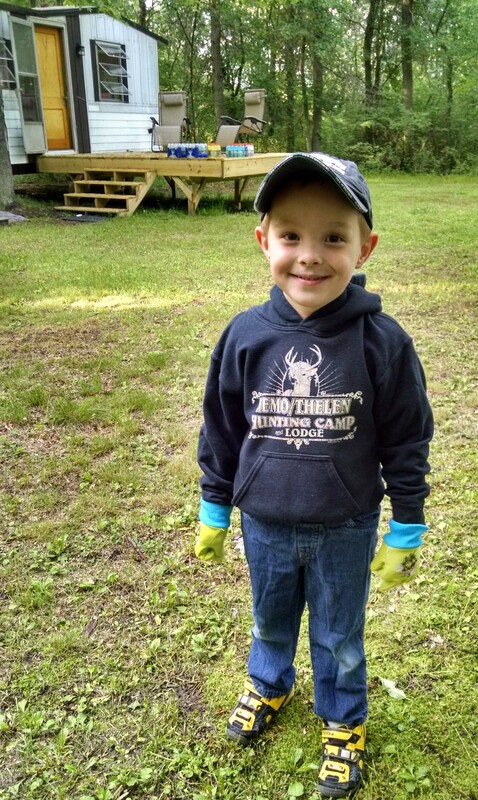 Jake gave Josh a ride around the yard by tethering Josh’s little blue buggy to his ATV. 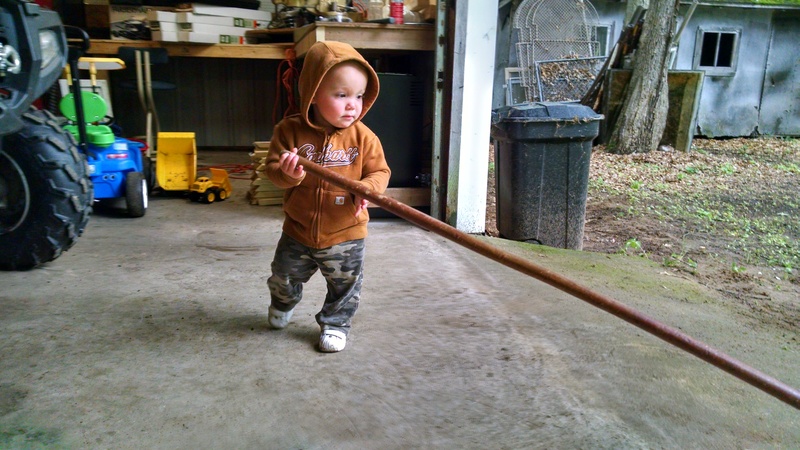 Josh was just as fascinated by the shop broom in the pole barn as he is with the one in the garage at home. He helped me sweep for a bit. The rain picked up and drove us inside the trailer where we had some lunch that Lyssa brought up. Josh got fussy at being cooped up and Jake was fighting a nap, so Lyssa and Josh headed home earlier than planned. The weather really put a damper on the plans for the day; we were all going to go to Green Lake together if it had been nicer out. Jake took an almost three-hour nap. I took the time to watch a movie, do some reading, and be generally lazy. The rain finally quit for the day around 4:00. While Jake slept, I read up on Markesan’s June Dairy Days. When I was reading the paper at Aunt Judy’s this morning, Jake pointed to a picture of a big tractor going down a city street. It was an article about the farm parade that would be happening tonight in Markesan. He thought that sounded pretty cool. Given we didn’t get to do much fun stuff outside today because of the weather, I decided we’d go check it out and stay here an extra night. I ran this by Jake when he woke up and he was thrilled. There was still plenty of time before the parade started and Jake wanted to go for a “big 4-wheeler ride”. Before we went anywhere though, I hooked up the ride-along seat that had come with the blue ATV when we bought it. I had taken it off at the time since we didn’t ride doubled-up enough to use it. 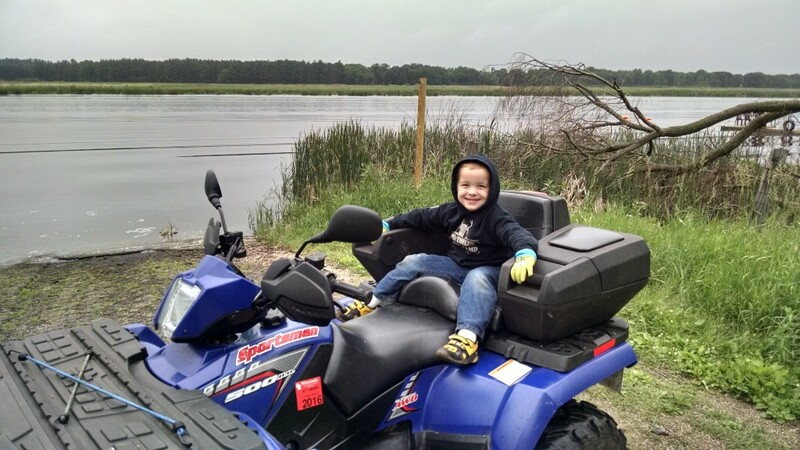 But I get nervous when he rides in front of me that he’ll smack his face against the pod or handlebars on a bump in the marsh, so I figured the seat would prove useful. He loves it! It keeps the wind out of his face and the heat of the engine isn’t right on his legs this way either. 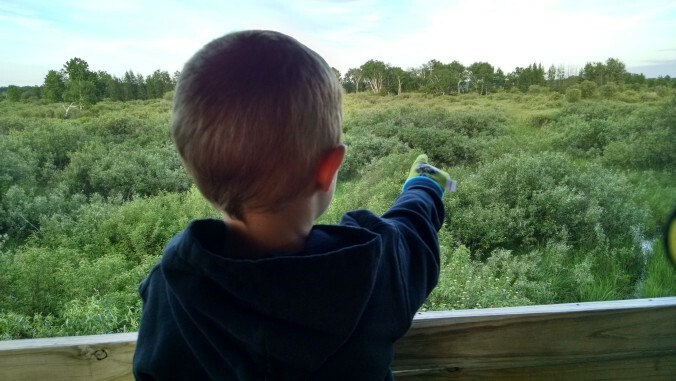 Now that I can drive with two hands and have room to lift up my feet, we were even able to explore the big marsh loop. Lots of water out there but we never got stuck. We rode down to the boat launch, too, just to see how high the water was along the river. Jake was really excited to be able to check everything out from his new chair. It was getting close to time for us to leave, so I made a quick dinner from the food Lyssa brought up for us. Jake just wanted a hot dog and some fruit, and I had some tacos. The temperature was slowly creeping up and it was pretty humid, so we changed into some lighter clothes and headed out to the parade. I wasn’t sure where they would set up or what the parking situation would be, but we lucked out. We got to Markesan around 6:40 and found parking in a big lot by an implement rental center. The street was lined with people but we found a nice open spot by the river bridge and set up our chairs. Jake was pretty much vibrating with excitement. The parade kicked off right at 7:00 with around 30 fire and rescue vehicles. A marching band followed, then some classic cars, and there were even some Shriners on minbikes. Finally, we got to the tractors and semis. There were dozens of antique tractors and modern equipment of all sizes. 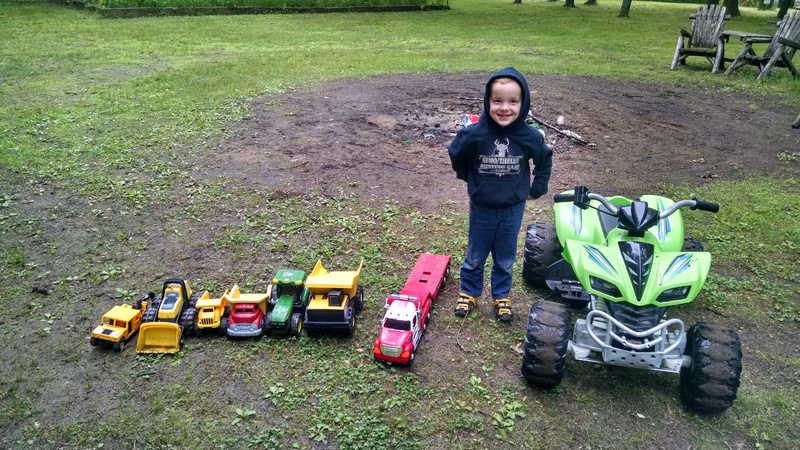 His favorites were the eight-wheeled tractor and the “one you could drive a car under”. And since there weren’t any other kids sitting near us, he got a huge haul of candy. It was a fun night. 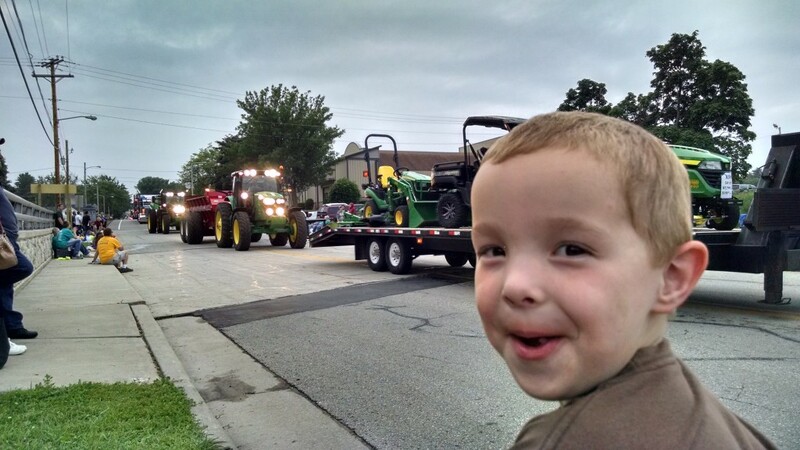 A parade is something I’d never really take time to see myself, but I loved watching him marvel at all the machinery. He talked about it all the way back home. Wired from the parade and his huge nap, Jake wasn’t ready to settle down. He wanted to take a “night ride” on the blue ATV, so I obliged. We went up and down Wicks Landing and Roeder Road and saw some deer, a turkey, and another snapping turtle. It was dark by the time we made it back, but he wanted to take one more pass through the marsh. We stopped to listen for owls, but no luck. He liked hearing all the peepers, at least. It was almost 10:00 by the time we closed up the pole barn and came inside for the night, but he still wasn’t tired. We ended up watching The Fox and the Hound until 11:00 before he finally decided we could go to bed. Found myself wishing I had turned the A/C on; it was still near 70 and very humid. Up around 7:00 again. I slept pretty restlessly thanks to the combination of the humidity and a tiny bed partner who’s apparently allergic to being stationary. Jake wanted to finish his movie, so we lounged around and ate a scavenger’s breakfast. Once The Fox and the Hound wrapped up, I put on The Iron Giant and got in a short nap while he watched and played with his Hot Wheels. We got dressed and headed out around 9:30. Jake wanted a last big 4-wheeler ride, so we went down to the boat landing again. Sunny and breezy today; shame we couldn’t have had this weather yesterday instead. Managed to get in a small bonfire as I burned our garbage and some scrap wood while packing the truck and cleaning up in the trailer. 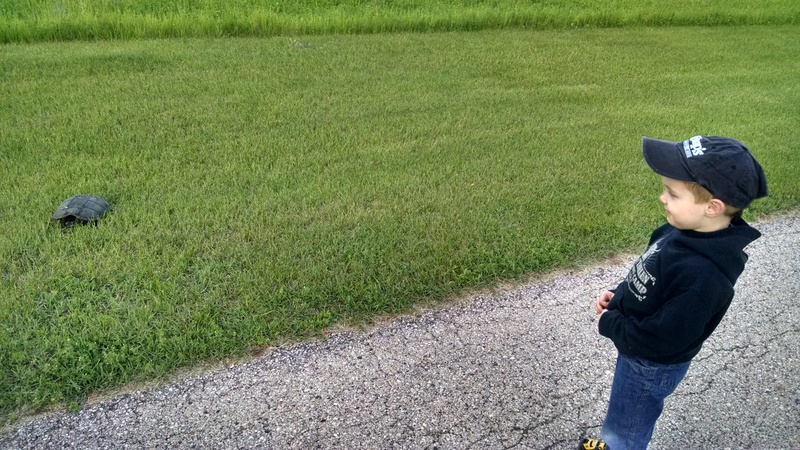 Jake played outside with his trucks again and was sad to have to go, though he told me he missed Mommy. We left at noon. On the ride out, we saw a doe running through a field with two young fawns trailing behind her. “Those are the babies and the mama reindeer that aunt Judy saw!” This guy remembers everything. I had such a special weekend with my buddy. I feel blessed to get to share my favorite place in the world with my son, and I’m so happy he loves it as much as I do. I typically keep the log entries limited to things that happen while I’m at Puckaway, but this seemed appropriate to add here. After we got home to Oshkosh and I dropped off Jake, I picked up Paco and we headed to St. Lawrence Seminary in Mt. Calvary where he went to high school and now works. 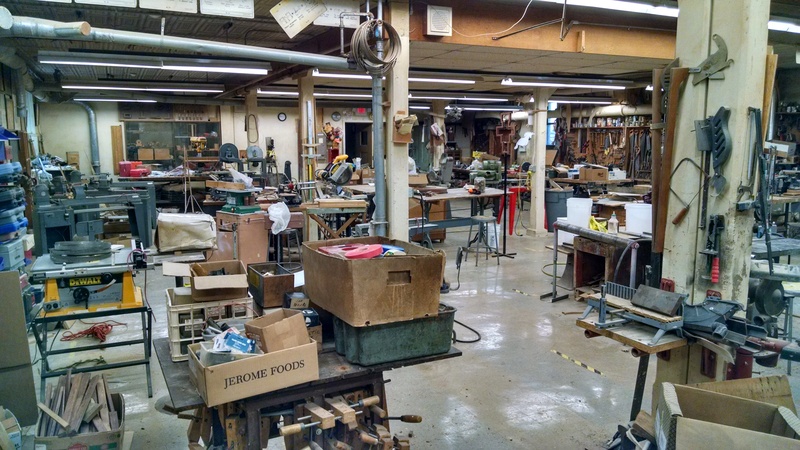 He had told me earlier in the week that they were cleaning out their wood shop and would have tools, equipment, and wood free for the taking. I wasn’t sure what to expect going into it, but walked into a shop that seemed all too familiar. I’m sure the man who ran this shop would have felt a true kinship with Richie. Every corner of every room was stacked with boxes, jars, and cartons of parts and tools of every kind. On the surface, it looked like pure chaos, but you could tell that it made sense to the person who accumulated it all. It took me back to how the pole barn used to be when Grandpa was still here. You could walk in only so far through the north garage door and could only reach the east door by carefully navigating your way along a narrow path beset by barrels, cabinets, blankets, seed bags, beer can collections, chains, and all sorts of seemingly random supplies. My dad, my uncles, and all Richie’s friends who had ever seen the place used to joke with him that it’s a wonder he didn’t get lost in there (and there actually was an incident where he got trapped for almost an hour when a stack shifted on him; I’m sure I’ll find it when I go through the log archive), but he had instant recall of the entire inventory of the building. 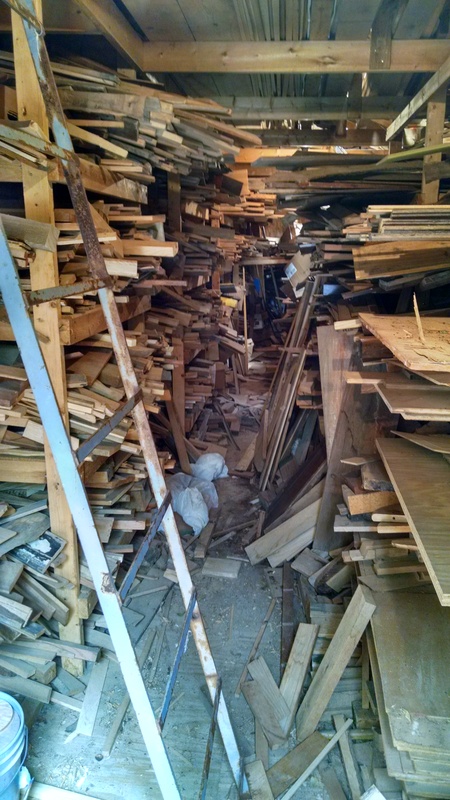 I’ve spent years–sometimes with the much-valued help of Red and Farmer Joe, but often alone–trying to sort, clean, and make my own sense of the pole barn. 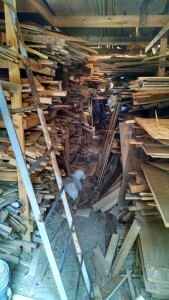 Seeing the stacks of wood, parts, and tools at St. Lawrence was strangely comforting. Grandpa certainly wasn’t the only person to ever let his ambitions and plans outpace his ability to see them through. And I’m not alone in having to figure out how to best sort out that kind of legacy. Of course, I couldn’t leave empty handed. I got some unique woodworking tools and nice pieces of hardwood. Next trip up, I’ll bring them to Puckaway. That’s part of the legacy, too. And if someone ever needs use of anything, I’ll know exactly where to find it.